Oh man. I am drained. Such a gorgeously touching film, with at least four scenes that bring a lump to my throat and tears to my eyes. I’m not being hyperbolic here, I’m actually somewhat dazed by the emotional impact this movie had on me. I love everything about it. I love the film’s raw simplicity, a no-fuss narrative that moves along with casual elegance, providing an immediacy that does the job of making these characters so endearing. I love “Guy” and “Girl”, two real people living real lives with real reactions to each other. 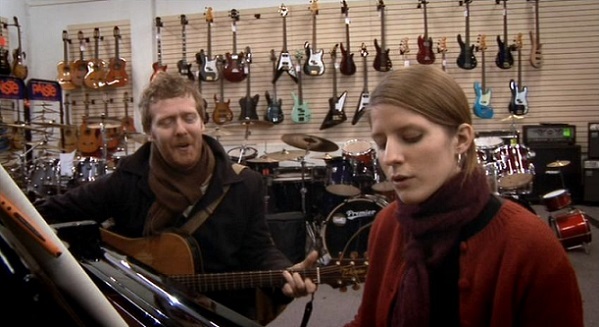 Glen Hansard and Markéta Iglová are magnificent and charming, but without any sort of idealized sheen. It feels like an incredibly honest portrayal of how this relationship would develop. I love the film’s celebration of creativity and the creative process. The joy of collaboration is felt deeply, and the recording session is true to my own experiences (“car test” and all). I love how when Iglová sings “If You Want Me”, you can hear Hansard’s vocals, and in the next scene Hansard sings “Lies” and you can hear Iglová’s vocals. It’s a “cheat” in the sense that the film is taking creative liberties — in those scenes, neither of the co-singer’s vocals would be present — but it works beautifully to connect them through song. I love the soundtrack. It’s not enough to say there’s no bad songs on it. There’s no songs on it that aren’t fantastic. “Falling Slowly” will be happily, beautifully ringing in my head for some time to come. I love the surrounding characters, who are a fine group of folks. Even the heroin addict in the beginning is given a fair shake. And oh my lord, I love that final shot. It’s uncommon for a film to be open-ended in a way that leaves both possibilities equally satisfying. It’s beautiful either way, and somehow the thought of an ending that neatly resolves everything is unpleasant. The movie lets us spend time with these characters, fall in love with them, and then generously allows us to imagine their futures on our own. At the risk of getting too sentimental, I would say it’s a lovely gift. I wouldn’t want it any other way. To use a strained musical analogy, the ending of this movie is pitch perfect. This entry was posted on April 21, 2014 at 7:00 pm	and is filed under Movie Reviews. You can follow any responses to this entry through the RSS 2.0 feed. You can leave a response, or trackback from your own site. One of my all time favourites and you said it better than I ever could! There’s no glossy hollywood tropes or cheesy dialogue – just a naturalism through the entire film and, like you said, an incredible soundtrack. It’s a shame John Carney went and made “Can A Song Save Your Life?” that I saw at TIFF last fall. He basically remade this film for a US audience – has some of the same charms but lacks all the heart and raw appeal. I have not heard of that other film. Sounds like a bad idea. I just checked Letterboxd and now he’s renamed it to “Begin Again”.